Lokomotiv Kuban Krasnodar edged Laboral Kutxa Vitoria 85-84, winning for the second straight week on a late Krunoslav Simon three-pointer. The hosts trailed by 8 with two-and-half minutes remaining, but rallied behind Marcus Williams, who assisted on the game-winning three. The victory gave Lokomotiv a 4-1 record in Group D, which will keep the club at least tied for first place at the end of Round 5. Vitoria dropped to 2-3. 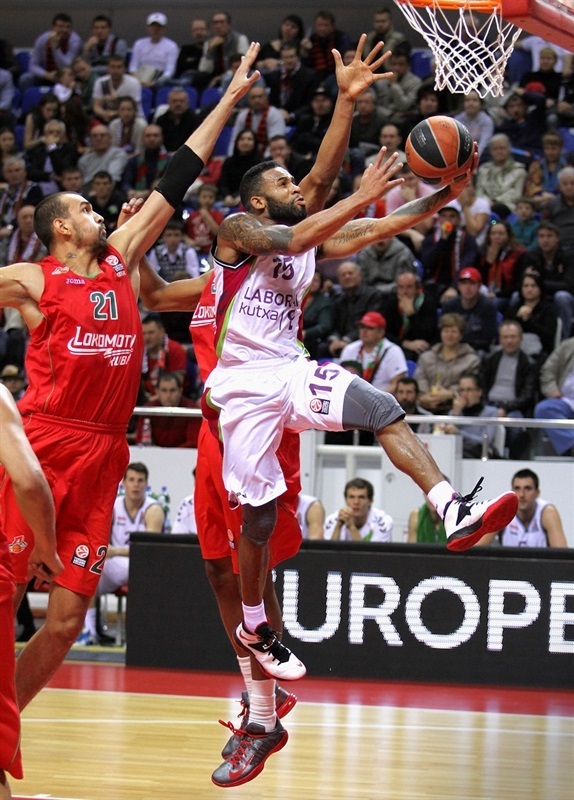 Lokomotiv led by double figures in the first quarter, but Walter Hodge led the visitors back. The game featured many momentum swing the rest of the way until the final seconds. 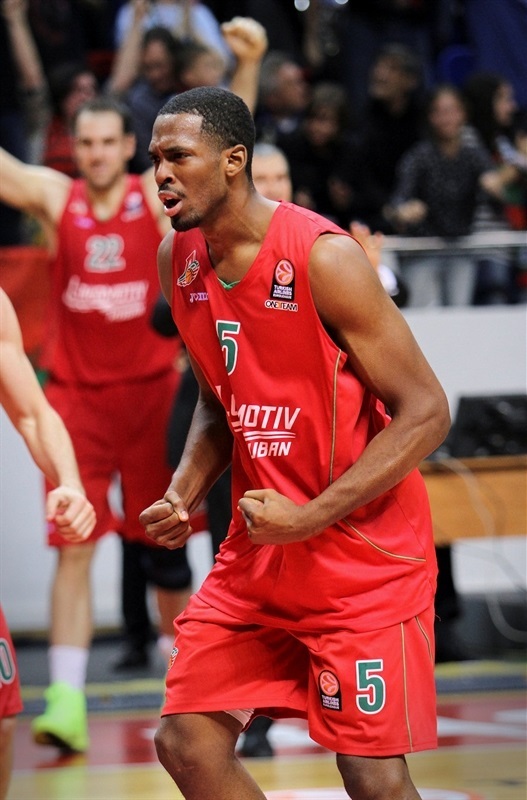 Derrick Brown led the Lokomotiv attack with 23 points on 10-of-12 shooting. Simon finished with 19 points and 6 assists, while Williams tallied 13 points and 9 assists. Milko Bjelica scored 16 for Vitoria. Tibor Pleiss posted 15 points and 10 rebounds. Andres Nocioni added 15 before hobbling off in the fourth quarter with an apparent left knee injury. Walter Hodge amassed 12 points and 8 assists and Thomas Heurtel and Thomas Kelati finished with 10 points apiece. Brown scored in transition for the game’s first points and then blocked a Nocioni three at the other end. Heurtel penetrated for Vitoria’s first points a little more than two minutes in. 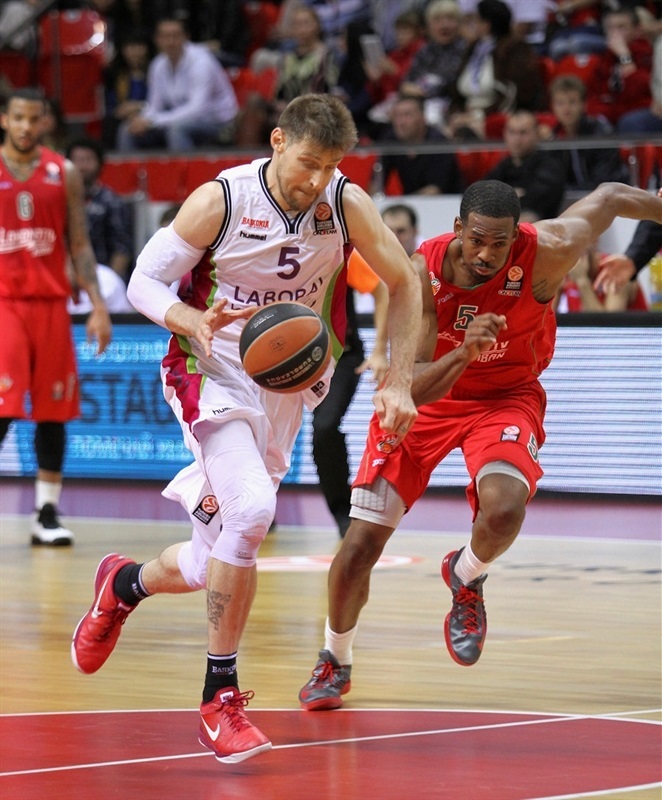 The visitors took the lead on a Pleiss tip-in and again through Nocioni. The hosts stayed even thanks to baskets from the starting guards, 6-6. Simon came in at the TV timeout and on his first touch sank a three. Lokomotiv got out on the break, turning a Richard Hendrix block into a slam for Brown and a Simas Jasaitis steal into a Williams dunk as the hosts grabbed a 15-7 lead. Laboral slowed down the attack, but was still unable to get shots near the basket. Jasaitis and Williams played a give-and-go that resulted in a layup for the latter and a double-digit Kuban lead. Bjelica ended a three-plus minute scoring drought for Vitoria before Brown dropped in a circus shot. Hodge came in and penetrated for a pair of scores to trim the gap to 21-13 through 10 minutes. 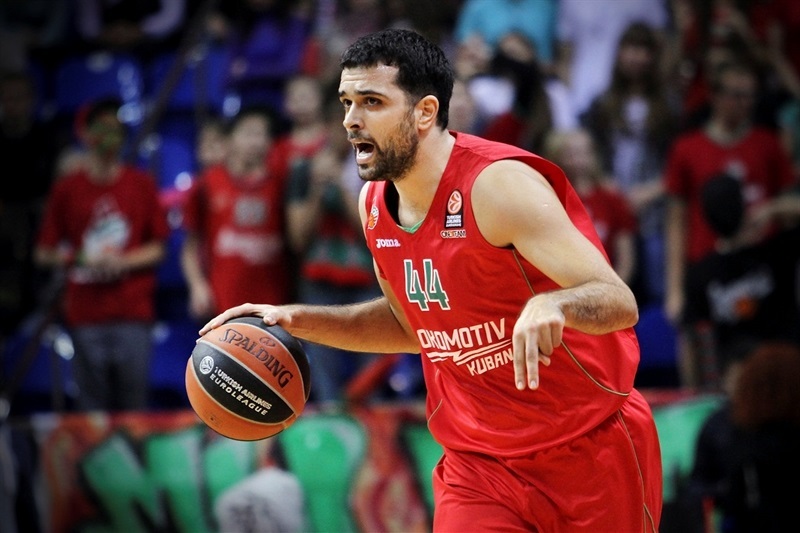 Simon drove and got some help from the rim to keep Lokomotiv in control. Hodge drove, but this time dished to Bjelica, who was fouled and made 2 at the line. Brown matched him with 2 free throws at the other end. Thomas Kelati sank a three, but Valeriy Likhodey did the same, 28-18. 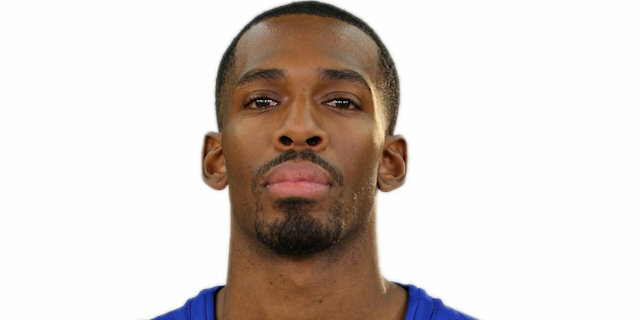 Brown remained hot with a jumper. Bjelica and Hodge each struck from downtown to half the deficit to 30-24. Bjelica found a hole in the Kuban defense and attacked it for a two-handed slam. Hodge came through with a steal, layup and foul to cap a 0-11 charge that brought Vitoria all the back to within 1. Williams responded with a jumper to revive the hosts. Nocioni stole the ball at midcourt and took it in for a layup. Hodge darted through the Kuban defense to bring his team within 36-35, but the momentum seemed to swing back Lokomotiv’s way with a high-flying fastbreak jam. However Nocioni came through with a fast break layup plus foul to keep his team within a basket. Pleiss threw in a hook off the glass to even the score before Heurtel’s steal and layup made it 40-42, a lead the visitors protected till the break. A minute into the second half, Pleiss added to Vitoria’s lead with a basket inside. Lokomotiv was able to penetrate on several occasions, but missed tough layups and Hendrix’s persistence on the offensive glass went unrewarded. Instead a David Jelinek triple made it 40-47. Williams made a jumper for Loko’s first points of the half. Pleiss, first with free throws and then a basket inside, continued to fuel Vitoria. Brown sank a jumper a jumper only to see Pleiss get to the line for 2 more, 46-53. Sergey Bykov drove for a layup, but then missed another. Jelinek punished the home team with a triple. Simon came off a timeout and pulled up for a three. He then fed Hendrix for a point-blank layup. Simon continued to provide nifty assists; he dished to a cutting Mantas Kalnietis for a layup that capped a 9-0 run and gave Lokomotiv a 57-56 edge. Pleiss drew Hendrix’s fourth foul and sank the resulting free throws to put Vitoria in front again. Lokomotiv regained control by stopping Pleiss inside before a Simon jumper put the hosts up 61-58. 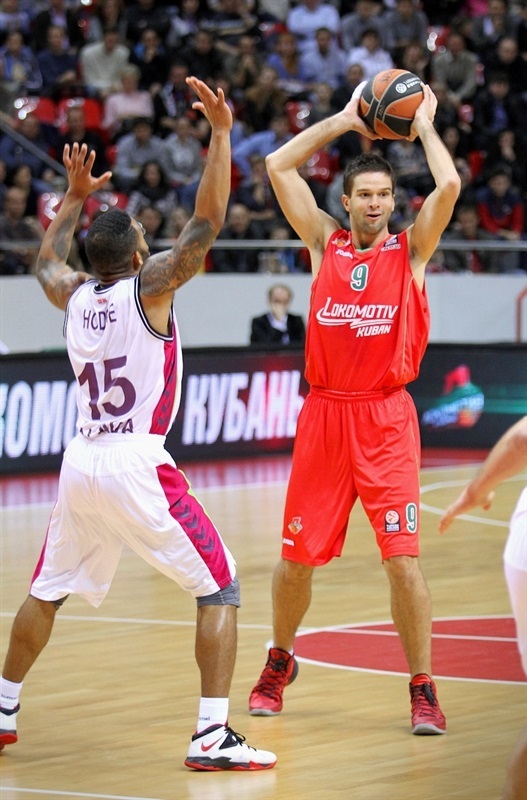 Lokomotiv added to its lead through Andrey Zubkov before Kalnietis sank a runner for a 7-point lead. Kelati sparked Vitoria with a steal and layup. Nocioni got a loose ball and stormed downcourt for a layup and foul to silence the crowd at 65-64. 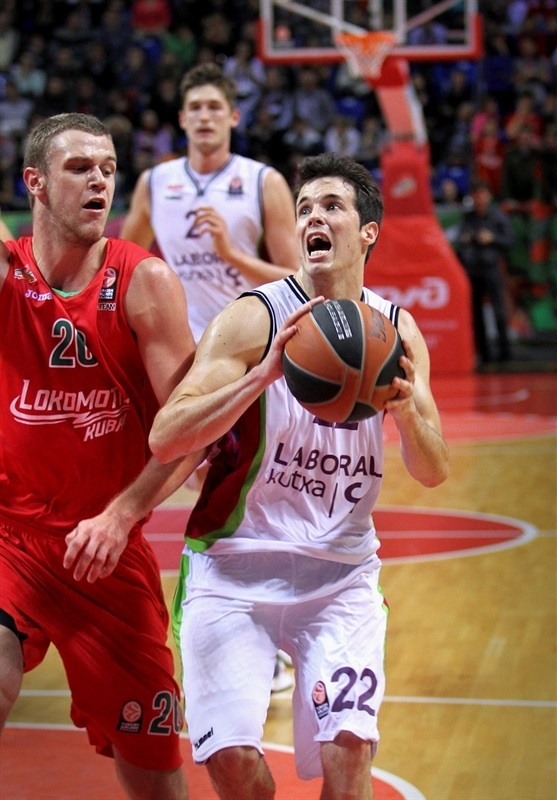 Heurtel extended a 0-8 Laboral run that put his team in front again. 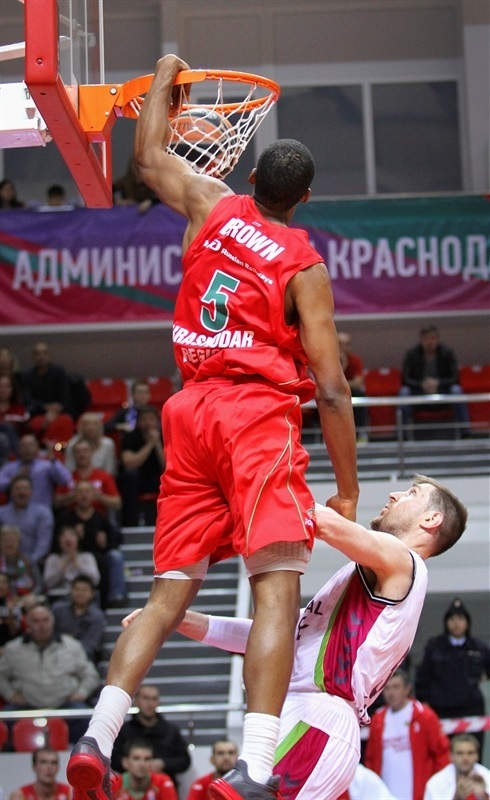 Nocioni added a tough layup before Brown came back for Lokomotiv. The forward quickly got to the line and split free throws. Heurtel hit a jumper from the corner; Brown hit from the elbow. Left open, Bjelica drilled a three to make it 68-73. Nocioni hobbled off with an apparent left knee injury, which he sustained trying to stop Aleks Maric in the paint. Heurtel and Brown traded buckets. A Jasaitis three-plus foul brought the hosts within 75-77 with three and a half minutes to go. Simon committed an unsportsmanlike foul on Bjelica in the paint. The result: 2 made free throws and a Bjelica follow-slam. Then Kelati stole the inbounds pass and made it 75-83. A tip-in from Hendrix and layup from Williams gave Loko hope, though he missed the resulting free throw that would have made it a 3-point game. After Kelati split free throws, Williams was fouled shooting a three with 36.6 seconds remaining. He made all 3 to bring his team within 82-84. Heurtel missed a jumper and Laboral did not adjust its defense quickly enough in transition; Williams spotted an open Simon who drained the go-ahead three with 6 seconds remaining. 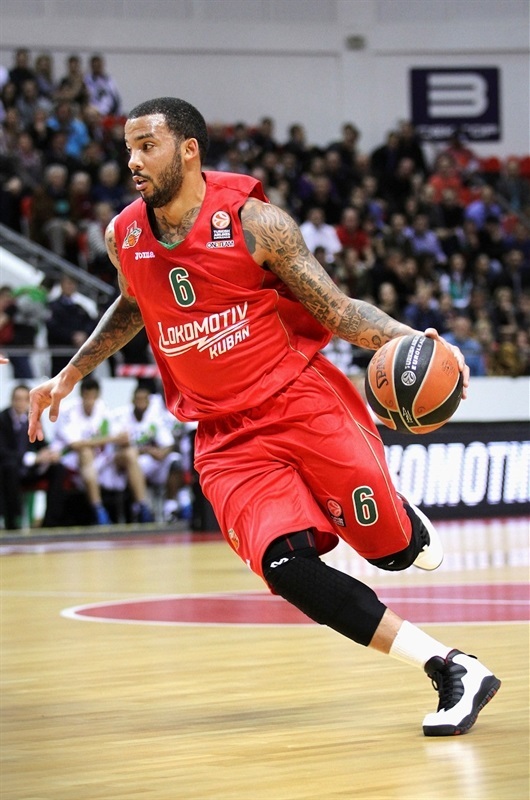 Laboral had one last chance and gave the ball to Hodge, whose last-second floater rimmed out and set off the celebrations in Krasnodar. "First of all I want to thank my players. We were able to control the game on defense for most of the game except for a stretch in the second quarter. Bjelica gave us a lot of trouble; it's always hard to play against a big man who sets picks and pops at the perimeter. But in the end we were able to put him under control and that helped us to win. It's always tough to play against fast paced Spanish teams, especially when you have three of you very important players in Kalnietis. Maric and Simon injured and not practicing for a week. But we really showed our character today!" "We started the game without focus, but already in the second quarter our bench gave us a boost and we managed to score 29 points against this very strong defensive team. We started losing this game at the moment when it seemed like we controlled everything. But then we fouled on three-pointers two times and made bad offensive decisions, which cost us the victory. " "It looks like Krunoslav is the luckiest guy in the world. If you're planning to play the lottery, call Krunoslav. This victory is very important to us; we needed to win at home, to show our character. Our main goal is to stay together each and every game, show the world that we're well-coached and motivated. If we can do that, we can do many good things. "